I forget when I first met Dr. Christine Simmonds-Moore, but it must have been in a convention, probably one of the Parapsychological Association conventions. Since then I have shared many good moments with her and with her family. Christine has a PhD in psychology from the University of Northampton, and a Postgraduate Diploma in Consciousness and Transpersonal Psychology from Liverpool John Moores University, both in the UK. After teaching at Liverpool Hope University she moved to the States. She is currently an Assistant Professor of Psychology at the University of West Georgia, where she teaches parapsychology, research methods, and other topics of psychology. 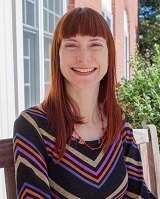 Christine is interested in psychological variables related to the occurrence of anomalous or exceptional experiences. This includes experiences related to schizotypy, synesthesia, and transliminality. In addition she is keenly interested in the relationship between mental health and anomalous experiences. An extremely dynamic person, Christine received awards early in her career. These were the Schmeidler Outstanding Student Award (granted by the Parapsychological Association) and the D. Scott Rogo Award for Parapsychological Literature (from the Parapsychology Foundation). I have been asked this question many times. Although I have not experienced many subjective paranormal experiences, I think that I have always been interested in mystery and in trying to understand aspects of our reality that are liminal, or little understood. As a child, I read mystery books and enjoyed digging for treasure in the back garden (yard). I remember being very scared of the dark and had a couple of frightening nocturnal anomalous experiences as a child (which I would now label as some aspect of hypnagogia or sleep paralysis). At school, I remember discussing ghost stories avidly with other students and being particularly fascinated by one story of a friend who lived in a converted mill – sightings of a maid who just walked down the corridor, but didn’t seem to notice the witness. At University I discovered some old parapsychology journals in the library, but they stopped in the 1970s, and so I assumed that this area of psychology was no longer alive (I later discovered that Hansel had been at University of Swansea, hence the existence of these journals). My main interests in the field are in states of consciousness, personality, mental health and the psychology of belief and disbelief. For example, some of my work has focused on the construct of boundary thinness (tapped psychometrically as positive schizotypy, transliminality, and temporal lobe lability) and its relation to exceptional experiences and beliefs. It fascinates me that there are two types of positive schizotype – both are more prone to experiencing exceptional phenomena, but there are differences in terms of cognitive factors enabling control and application of exceptional experiences. This implies that being prone to exceptional experiences is neutral in terms of mental health, and other factors influence whether they are positive or negative in nature. Recently, I have been exploring synesthesia and how this relates to exceptional experiences and mental health. I would also say that one of my interests is in normalizing this field. I enjoy traditional parapsychological experiments, but am discovering that I am equally interested in exploring exceptional experiences in an ontologically neutral manner. I have become interested in the subjective meaningfulness of these experiences, and in exploring how these experiences may be associated with health and wellbeing (as opposed to addressing psi as some form of pathology, which appears to dominate much of the literature on belief in such phenomena). Interestingly, my colleague Nicola Holt and I found that those who are healthy positive schizotypes did better at a psi task than those who were less healthy, and as such, psi phenomena may well occur more within a healthy system. More work is needed to explore this idea. Generally, I consider that there is much to be gained from harvesting the overlaps between the fields of parapsychology, transpersonal psychology, positive psychology, humanistic psychology, cognitive psychology and clinical psychology. I have put together two conferences exploring clinical approaches to exceptional experiences, as I feel there is a need for the integration of subjective paranormal and spiritual experiences into clinical psychology in a way which approaches experiences from an open-minded perspective as to the reality of psi phenomena. I consider that parapsychology might be part of an interdisciplinary area of exceptional psychology, which seeks to understand the correlates, meaningfulness and application of experiences which do not necessarily only fall under the umbrella of parapsychology. I think that parapsychology, and related disciplines are asking questions about the nature and capacity of the mind and human consciousness which are neglected in other areas of inquiry. Parapsychology studies experiences that are reported by people across different cultures and times and are therefore part and parcel of being human. By studying these experiences (including what looks like ESP but isn’t – after the late Bob Morris, it has been possible to learn more about the capacity of the human mind, states of consciousness, dissociation, the nature of self and identity, hallucinations, creativity, the mind-body connection, the capacity for healing, self-deception and cognitive biases. Such experiences may have been pivotal in generating ideas that are central to the world’s major religions, such as the notion of a soul. Some experiences also cause great fear and share overlaps with pathology. For these reasons, we need to understand more about the experiences themselves, peoples’ reactions to, and explanations for these experiences, as well as notions of human potential. This is a big question. I would say that in some sense, parapsychology is as successful as mainstream psychology, if not more so as a science. The methodology that is employed is often extremely well designed, showing much more awareness of the need for controls, ruling out possible confounds and normal explanations. There is also careful consideration of the need to pre-specify hypotheses, state which findings were predicted versus post hoc, etc. However, it may well be that scientific methods should not be at the core of either discipline. In some sense, there is a paradox in parapsychology’s definition – the scientific study of phenomena that are fall outside of or violate the way in which mainstream science conceives the world. In some ways, parapsychology faces the same problems as mainstream psychology. Can we ever understand aspects of human experience by recourse to hypothesis testing? We can never “prove” anything with hypothesis testing. We only ever have a degree of support for a pre-specified hypothesis. Over time, we see patterns in outcomes from different experiments and different experimenters. In addition, in parapsychology, we also have to think about what is being hypothesized – usually better performance at psi, but it is easy to forget that this is not a thing, it is what we see when we rule everything else out, and is a process of information transfer without the use of the normal senses. When we get further into the parapsychology literature, it gets more muddy as a fundamental property of “psi” appears to be that it is influenced by belief (or disbelief), and further, it is not clear that we will ever know what the source of that belief is in determining outcome. According to skeptical arguments, this is a property of methodological tightness (better experiments find less psi), but this does not pan out in the literature. It would be interesting if a variety of experimenters from different belief backgrounds would genuinely engage in a psi study, just to see what happened in terms of overall outcomes (in a manner similar to Wiseman and Schlitz’s staring study. These are the kinds of study that are fascinating and revealing about reality. According to Carpenter’s model, the source would be the person with the most meaning invested in the outcome of an experiment. Is this the experimenter or the participant him- or herself? However, the source of psi is something with which parapsychology has always battled. Discarnate source or living? The potential of one’s own subliminal or unconscious mind? The strong influence of another mind? That belief or expectation may influence the observable is fascinating but also problematic for using the scientific method to demonstrate (once and for all) whether something exists. However, parapsychology has told us something that probably applies everywhere – as such, this may be one of the most intriguing findings of the field. I still think that we should be doing experiments, but the experiments should be creative, and supplemented/triangulated by other methods, including qualitative explorations of the nature and meaningfulness of the experience and who has the most meaning invested in a given study outcome. I have just completed a Bial funded research project (with Carlos Alvarado and Nancy Zingrone on synesthesia and its relationship to anomalous experiences, including performance at a psi task. This was a fascinating project which indicates that tendencies toward synesthetic thinking are associated with exceptional experiences, including subjective paranormal experiences. I am about to begin a project exploring belief, disbelief and experiences with the Shakti helmet with Dr. Don Rice at the University of West Georgia. I am also working on revising a chapter on the boundary construct for a book project coordinated by Alejandro Parra; continuing to work on developing a psychokinesis questionnaire with Sally Rhine Feather and working on developing previous research into research articles. Simmonds-Moore, C. A. (2012). What is Exceptional Psychology? Journal of Parapsychology: Special Issue Celebrating the 75th Anniversary of the Journal of Parapsychology, 76 /Supplement, 54-56. Holt, N., Simmonds-Moore, C., Luke, D. & French, C. (2012). 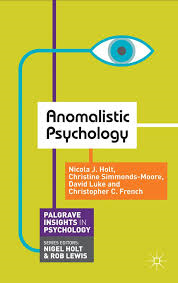 Anomalistic Psychology. New York: Palgrave MacMillan. Simmonds-Moore, C.A. (2012). (Ed.). Exceptional Experience and Health: Essays on Mind, Body and Human Potential. Jefferson, NC: McFarland Press. Simmonds-Moore, C.A. (2012). Exploring ways of manipulating anomalous experiences for mental health and transcendence. In C. Simmonds-Moore (Ed.). 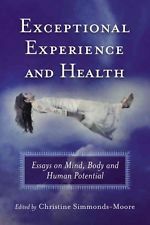 Exceptional Experience and Health: Essays on Mind, Body and Human Potential. Jefferson, NC: McFarland Press. Simmonds-Moore, C.A. (2009-2010). Sleep patterns, personality, and subjective anomalous experiences. Imagination, Cognition and Personality, 29, 71-86. Simmonds-Moore, C.A (2010). A review of the relationship between anomalous and paranormal experiences and boundary thinness in the mind and brain. In M. D. Smith (Ed). Anomalous Experiences: Essays from Psychological and Parapsychological Perspectives. Jefferson, NC: McFarland Press. Simmonds-Moore, C.A (2010). Personality variables in spontaneous psi research: Contextualising the boundary construct in its relationship to spontaneous psi phenomena. (pp.151-215). In C.A. Roe, W. Kramer and L. Coly (Eds). Utrecht II: Charting the Future of Parapsychology. New York: Parapsychology Foundation. Simmonds-Moore, C.A. & Moore, S. L. (2009). Exploring how gender role and boundary thinness relate to paranormal experiences, beliefs and performance on a forced choice clairvoyance task. Journal of the Society For Psychical Research, 73, 129-149. Simmonds-Moore, C. A & Holt, N, (2007). Trait, state and psi: An exploration of the interaction between individual differences, state preference and psi performance in the ganzfeld and waking ESP control. Journal of the Society for Psychical Research, 71, 197-215. Palmer, J., Simmonds-Moore, C. & Baumann, S. (2006). Geomagnetic fields and the relationship between human intentionality and the hemolysis of red blood cells. Journal of Parapsychology, 70, 275-302. Simmonds, C. A. & Fox, J. (2004). Note: A pilot investigation into sensory noise, schizotypy and extrasensory perception. Journal of the Society for Psychical Research, 68, 253-261. Murray, C.D., Howard, T., Fox, J., Caillette, F., Simmonds-Moore, C., & Wilde, D. (2002-2004). The design and implementation of the telepathic immersive virtual reality system. International Journal of Parapsychology, 13. Roe, C.A., Holt, N.J., & Simmonds C.A. (2003).Considering the sender as a PK agent in ganzfeld ESP studies. Journal of Parapsychology, 67, 129-145. Sherwood, S.J., Roe, C.A., Simmonds, C.A., & Biles, C. (2001). An exploratory Investigation of dream precognition using consensus judging and static targets. Journal of the Society for Psychical Research, 66, 22-28. Simmonds, C. A & Roe, C. A. (2000). Personality correlates of anomalous experiences, perceived ability and beliefs: Schizotypy, temporal lobe signs and gender. Journal of Parapsychology, 64, 252-253.